Backyards are for enjoyment and relaxation when fresh air is in need. Creating a space in the backyard that is peaceful, yet beautiful, warm and inviting can happen when using paving stones. The stones are useful in outdoor spaces to create a wide variety of different areas because of their durability, variety of colors and ability to transform. You too, can use the stones in your backyard. Read on for ideas from Hutcheson Horticultural Company in how you can expand your living area to the outdoors. One of the most common ways the stones are useful in a backyard, is to create patios. Patios are lovely for placing outdoor furniture on because they are level and sturdy. Creating a patio area outdoors can help you create a cooking space for your grill and outdoor dining table, a picnic area to enjoy on sunny days, or a comfortable reading area with soft outdoor furniture that provides pure relaxation. Paving stones also make outstanding walking paths through floral, herbal, fruit and vegetable gardens. This is because they add warm color and stability. Having a stable walking path to walk on with warm colors can help provide pure relaxation to the mind and body as you stroll through the gardens. Heck, you can even place a bench onto the walking path within your garden to sit upon on days when you simply need a space for thinking, eating lunch outdoors or just for reading a book in a peaceful place. 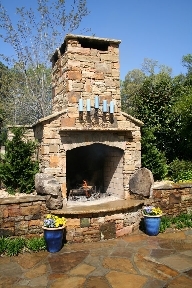 Enjoying an fire pit or fireplace will allow you to enjoy chilly nights. In addition to enjoying an evening around a great fire, Hutcheson has seen an increase in outdoor cooking trends. In many cases this involves roasting marshmallows or other open fire treats, but we have also installed grill islands for those that want an entire outdoor kitchen. Paving stones have endless uses for backyard purposes. All you have to do is use your mind and just be creative. Contact the design team at Hutcheson Horticultural for a consultation regarding your backyard paradise!